When making up nutrient media for hydroponics, it is usually just a matter of adding the required amounts of stock solutions or powder to the correct volume of water to get the right concentration for plant growth. However, with plants using up nutrients over time, we usually need a way to monitor when nutrient levels in the solution has reached a point where they are too low to sustain adequate plant health. This is where the electrical conductivity (EC) or total dissolved solids (TDS) meter comes in, since the number of nutrient ions in growth media used for hydroponics correlates with the electrical conductivity of the solution, and this is best measured using an EC (TDS) meter. However, it is not just nutrient solutions that need to be monitored for their dissolved solids, the purity of the water that is used to make up the nutrient solution in the first place, needs to be regularly assessed to ensure that most of the substances that are present naturally (and unnaturally!) in tap water have been removed. This is especially true after all the effort we are likely to have gone to in setting up a reverse osmosis water purification system in our homes. Any significant deviation in purified water EC or TDS from the norm would be an indication that something is wrong and hopefully will provide us with an opportunity to solve the problem before it becomes one for our plants. ​Electrical conductivity (EC) can be measured in units called Siemens (usually micro-Siemens (µS) or milliSiemens (mS)) and TDS meters convert this EC number into total dissolved solids (TDS) which has units of measurement in parts per million (ppm). The EC-TDS conversion, however, is not always simple. Different dissolved substances will affect the overall electrical conductivity of the solution differently so, for instance, a solution of calcium nitrate will have different electrical characteristics (and therefore TDS) to a solution of the same concentration but with potassium nitrate instead of the calcium nitrate. So how does the EC (TDS) meter know how to convert EC to TDS if it doesn't inherently know the nature of the substances dissolved in the solution being measured? Well, it approximates it and it can use different conversion multipliers to do so. The common conversion multipliers that are used today include those for sodium chloride (NaCl) where you multiply the EC value by 0.5, a salt mix referred to as 442 where 0.7 is most often used, and for potassium chloride (KCl) 0.55 is used. Most budget EC (TDS) meters will usually use one conversion multiplier to make the EC-to-TDS conversion, but some more expensive meters will allow you to choose between different conversion multipliers to get more accurate results in different measuring applications. Not to be confused with the EC-to-TDS conversion discussed above, EC (TDS) meters also need to be calibrated against one of a small number of standards including those made up with NaCl, 442, or with KCl. This is usually carried out on the meter in the factory before shipping but if you need to use the EC (TDS) meter for an application different to what the factory calibration method is ideally suited for then you may need to recalibrate the meter yourself using a more appropriate standard. So which calibration solution is best suited for which application? Calibration solutions are most often chosen because they most closely resemble the electrical characteristics of the solution to be measured ensuring better accuracy. So hydroponics calibration will often involve using KCl or NaCl standards, while for measuring water purity, NaCl or 442 standards are most often chosen. In addition, the concentration of the calibration solution itself is also application-specific, so for hydroponics, a higher concentration solution like EC = 1.5 mS is used since this is within the range of most nutrient solutions, while for water purity testing, a lower concentration solution is preferred since tap water, by its very nature, has relatively less things dissolved in it. For most hydroponic growers, absolute accuracy is not critical and so whatever solution your EC (TDS) meter happens to be calibrated against when you get it is usually good enough. Also, most EC (TDS) meters intended for hydroponics will already be calibrated against an appropriate higher concentration solution so recalibrating them is usually unnecessary. The same goes for most non-professional water purity testing. However, if you do find you have to re-calibrate your EC (TDS) meter, the easiest way to do so is to use a calibration solution that is quoted in Siemens since there is no EC-to-TDS conversion to complicate matters. But some calibration solutions (especially in the US) come with TDS values (eg. 1000ppm) so instead of calibrating against a specific Siemens value, you have to calibrate against a specific ppm value. The problem here is that the calibration solution ppm has been obtained by converting its EC into TDS using one of the conversion multipliers discussed previously and which is determined by whatever the calibration solution is made up of. So when you calibrate your meter with a calibration solution that is quoted in ppm, then you first need to match the EC-to-TDS conversion multiplier of your EC (TDS) meter to the conversion multiplier used for the calibration solution. With inexpensive EC (TDS) meters, you have to make sure you get the matching calibration solution that uses the same multiplier as the meter, but with more expensive EC (TDS) meters, you can sometimes choose from several different conversion multipliers (and therefore different calibration solutions) to use when calibrating the meter. Finally, hydroponic nutrient solutions often indicate what their EC value will be in the working solution, which is a useful starting point from which to assess how well your plants are feeding and when the nutrient solution needs changing. However, some nutrient solutions may come with values of TDS (ppm). Once again, in order to ensure accurate readings when assessing nutrient uptake relative to this TDS starting point, you need to match your EC (TDS) meter's EC-to-TDS conversion with the conversion multiplier the nutrient solution company used. Hopefully you are not totally confused by now! 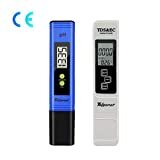 ​EC (TDS) meters come in two flavours, the more portable pen (or probe)-type meters (see ​table below), and the in-line type (see picture) that is designed to be directly inserted into piping to monitor the EC or TDS of a solution flowing within. 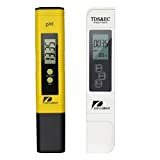 The pen-type EC (TDS) meters are used more commonly in hydroponics while the latter in-line types are usually used to monitor EC or TDS within water purification systems. Since our focus here is on hydroponics, it is best for us to concentrate on the pen-type of EC (TDS) meter. As with any device, there are a range of features that can be incorporated into a EC (TDS) meter. In general, the more features, the more expensive the equipment, but there are some essential features that are found on devices no matter the price. ​The Hold function is a common feature on EC (TDS) meters as it is an easy one to implement electronically so manufacturers tend to include it. It allows the user to use the meter in awkward places where the digital readout may not be immediately visible, like under heavy foliage or in the dark recesses of a reservoir. Pressing the hold button fixes the current EC or TDS reading to the screen (usually until it is reset) and provides time for a user to withdraw the meter to check the display. ​​As with pH, temperature affects the conductivity of solutions and therefore the EC or TDS reading. As the temperature increases, molecules in solution tend to have more energy and so the electrical conductivity increases resulting in an incorrectly high EC or TDS reading. Once again as with the pH meter, many manufacturers have added automatic temperature compensation (ATC) to their ​EC (TDS) meters that are designed for hydroponics to get around this problem. Since the device is measuring the temperature at the same time that the electrical conductivity is measured, this allows it to compensate for the temperature difference between the solution being measured and that of the calibration solution in which the device was last calibrated. ​Another important feature of EC (TDS) meters is their level of water-resistance. As with pH meters designed for hydroponics, there are two categories here, the waterproof ​​EC (TDS) meter and the water-resistant-only device. Obviously, the waterproof devices are the preferred option as one does not have to take as much care when using the device around bodies of liquid nor pay attention to how far the meter is dipped into the solution being measured. Unsurprisingly, waterproof devices are more expensive than the water-resistant ones. ​Since most, if not all, EC (TDS) meters are battery-operated, most, if not all, have an automatic shut off feature that shuts down the device when it hasn't been used for a while, allowing the device to conserve its battery power for when it is actually needed. The COM-100 meter from HM Digital is one of the best consumer EC (TDS) meters for hydroponics that is available to the consumer. It is accurate and durable, sporting a waterproof design so that if you accidentally drop it into the solution being measured, no harm will come to it. It uses 3x button-cell batteries that are housed in the cap and also has user-replaceable electrodes, although the ones that come with it will almost certainly last a very long time so the usefulness of this is a little circumspect - it is, however, nice to know that they can be changed if the need arises. One of the unique features of the device is the ability to measure the electrical conductance of solutions and provide several different conversion multipliers to give TDS readings - all user settable. It comes calibrated to 1.4mS KCl, so it is ready to use for hydroponic solutions out of the box, but it can also be digitally calibrated with other calibration solutions if preferred. Unsurprisingly, the COM-100 is automatically temperature compensated as you would expect from such a high-brow device, but it also displays the temperature for you on the display as an added bonus and you can even choose whether it comes up in Celsius or Fahrenheit. 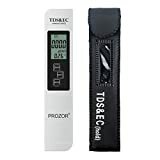 Unfortunately, you will have to pay top dollar for the privilege of owning this EC (TDS) meter, but at least you know that the unit will almost certainly last a lifetime. ​Another one of the best handheld EC (TDS) meters for hydroponics that is readily available to the consumer is the EC400 meter from Extech. The EC400 is a reliable, self-calibrating and tough EC (TDS) meter with a number of excellent features including the ability to measure both electrical conductance (EC) as well as total dissolved solids (TDS) using a range of TDS conversion factors. It is dust-proof and waterproof up to 1 metre (IP57), and it also has the ability to hold up to 25 different readings in memory. In addition, the probes on the EC400 can easily be replaced if damaged or reach the end of their lives, and there is also a probe extension for measuring less accessible solutions that can be purchased separately and which makes the meter even more versatile. ​For the most accurate readings, the meter should be calibrated in one or more of three specific calibration solutions (which are not included and have to be bought separately), namely 84μS/cm, 1413μS/cm or 12.88mS/cm solutions, which EC400 automatically recognises and calibrates to. The Extech EC400 also reads the temperature of the solution and automatically compensates EC and TDS readings for differences in temperature, as one might expect from such a high quality meter. Finally, the Extech EC400 uses 4 button-cell batteries for power, and has an auto-shut off feature that turns off the meter after 10 minutes of inactivity to preserve battery power. ​Overall, the Extech EC400 is an excellent choice for an EC (TDS) meter, providing everything one needs to measure and keep track of the concentrations of nutrient solutions used in hydroponics as well as for ensuring that the water used to make up those solutions is of sufficient purity. The EZ Digital TDS-3 is clearly a Asian copycat version of HM Digital's TDS-3 (see below) - they even gave it a name almost identical to the original! But just because it looks the same and sounds the same does not mean that it is as good as the original. It does feature a Hold function as well as automatic shutoff after 10 minutes, and it even comes with a nice carry case, which is useful when storing the unit. Manual calibration is possible with a screwdriver but if you do find you need to calibrate it, you would be better off buying a more reliable device. Certainly the price of it compared to the branded version is appealing, but as with most things in life, you are getting what you pay for, as it will not be as accurate or as well constructed as the 'real' TDS-3, and there is no sizeable public-facing company to stand behind it. ​If you just need an indication of TDS or significant changes to it, then this device is good enough, but for more pinpoint accuracy, and for detecting more subtle changes in hydroponic media, one of the better quality ​meters ​reviewed elsewhere ​on this page is ​preferable. HM Digital makes a range of EC and TDS meters and the TDS-3 is one of their more basic designs. Unlike their flagship model, the COM-100 discussed above and which can provide EC or TDS readings, the TDS-3 shows only a TDS reading. ​It comes calibrated against 342 ppm NaCl, which is typical of TDS meters ​designed for water sampling but not ideal in terms of accuracy, for higher concentration hydroponic solutions where calibration against a higher concentration solution would be preferred. Fortunately, it can be recalibrated relatively easily by users if necessary. It is also accurately automatically temperature compensated - something you are unlikely to find on cheaper TDS meters - and it can also be made to give a temperature reading at the touch of the 'Temp' button which changes the display appropriately. It uses 2 button cell batteries for power and has a Hold function with a 10 minute inactivity delay before automatically shutting off. Surprisingly, unlike some of its more expensive brethren, the TDS-3 comes with its own carry case which is useful for keeping the meter in pristine condition. However, unsurprisingly, the TDS-3 is not waterproof and care must be taken not to get the electronics part of the device wet (see diagram for maximum water level). Colemeter, an online retailer headquartered in Hong Kong, has been in existence for just over a decade. They sell a range of electronic measuring devices including a basic TDS meter. 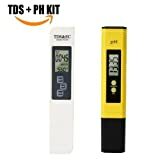 The Colemeter TDS meter is a simple and cheap device not unlike many of the other cheap generic TDS meters available on the likes of Amazon and eBay. As with other TDS meters, it has a data hold function and an automatic shutoff after 10 minutes of inactivity but does not give a temperature reading as with other TDS meters. 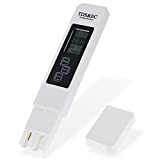 The Colemeter TDS meter is more suited for water meter testing than for hydroponics and should really be only used to show significant changes in dissolved solids, where there is not the need for high levels of accuracy.